Click on the "thumbnail" for a larger photo, then use your "back" button for returning to this page from the photos. Use the "back" button or the "Up" text on either of the navigation bars to return to this page from the narratives. Where narratives are available, there is a hyperlink, so noted, under the photo. Still More new post, these of Andrew! Andrew in his Sinclair Surcoat! Great look there, Andrew! Previous works of Mr. Spratt with much information in the narratives! I was born in Edinburgh in 1963 I'm married with two sons. 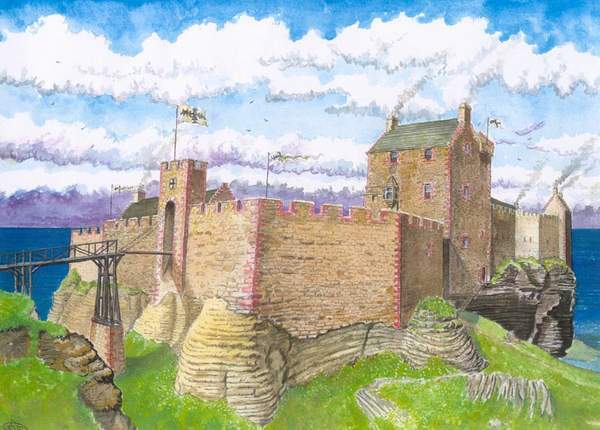 At the moment I work for Historic Scotland as the Custodian of Dirleton castle about 25 miles east of Edinburgh. Prior to this I was employed as a graphic Artist with the Scottish Examination Board while also doing history slide talks for SAGA and before this I worked as the Seasonal Custodian of Tantallon castle for nine years beside my father who was the head custodian. 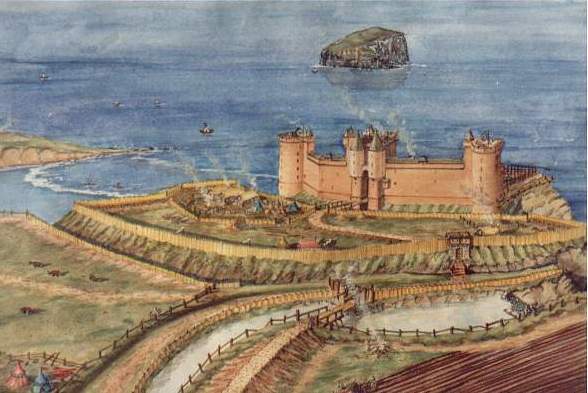 It was at Tantallon that I first used my reconstruction paintings of Scottish castles and battles to explain Scottish history to the castle visitors. 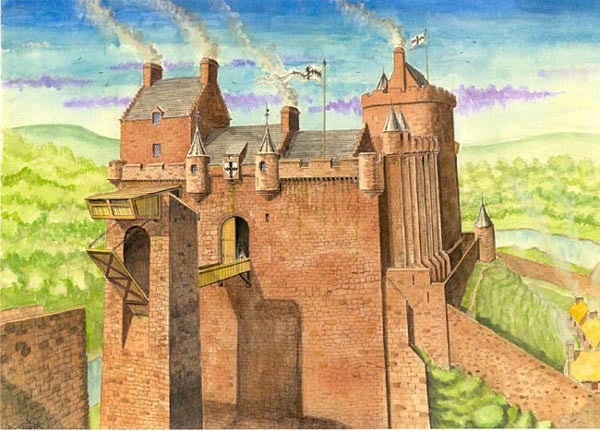 As a boy I was inspired by the work of the late Allen Sorrell who did beautiful reconstruction drawings of mostly English castles. 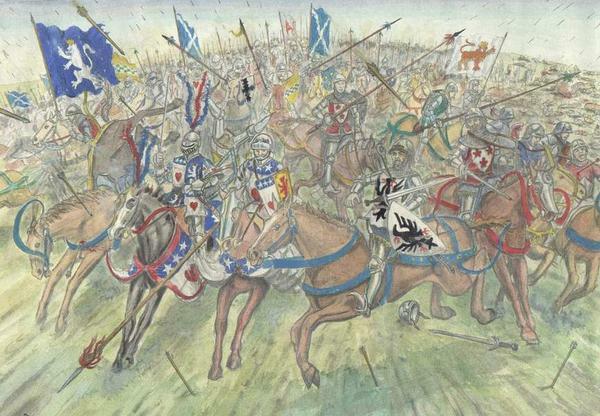 Whereas I planned to cover Scottish castles, battles and events from 1350 to 1650. 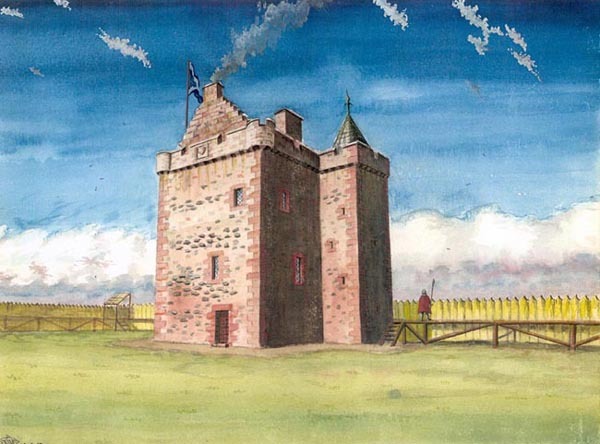 I have produced over 200 different castle/battle/event reconstructions in the past 17 years for use in such publications as The Scots Magazine, East Lothian Life, Border Life and various History Society journals. In my spare time I also write history articles for Clan Newsletters in the U.S.
Before starting a reconstruction of a castle I dig out as much archaeological and architectural evidence as possible and as many prints of the chosen castle from the 1700's and 1800's,though in ruins even then they still give clues as to their original shape and form. 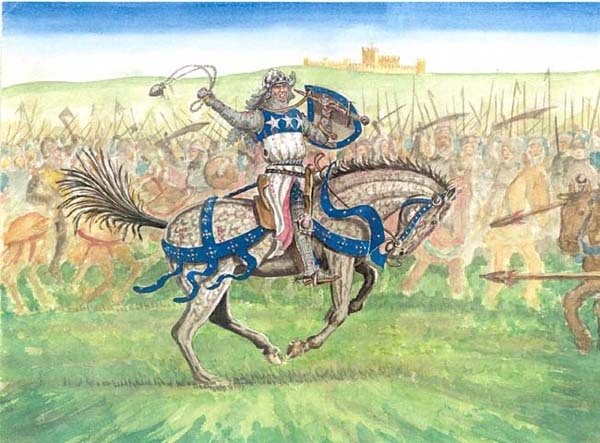 There is even more research involved when doing reconstruction battles since heraldry, weapons, armour and even things like the style of horses bridles have to be check down to the last detail. 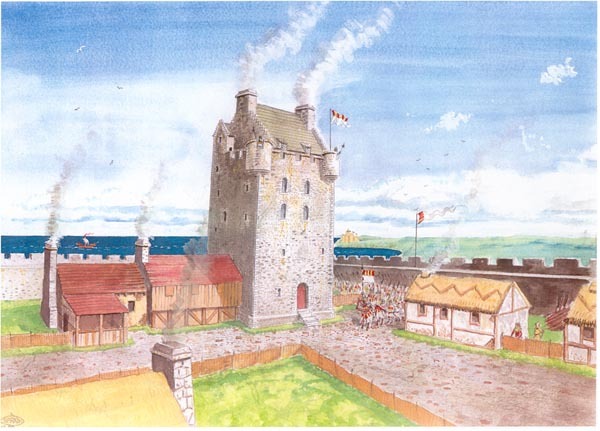 In many castle reconstructions I simply superimpose the outline of the original castle onto the present ruin,almost rebuilding as it were level by level. This drawing is then used as a template for the final watercolor painting. 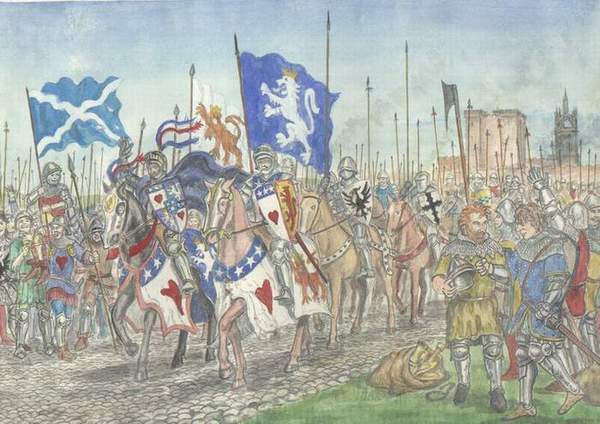 I use these finished reconstructions in my history slide shows that I do for Schools, History Societies and Clan Societies to help people understand the 'true' history of Scotland. I try to make sense of it's wars with England. Not the simplistic version presented by the likes of Hollywood with tartan and bagpipes. 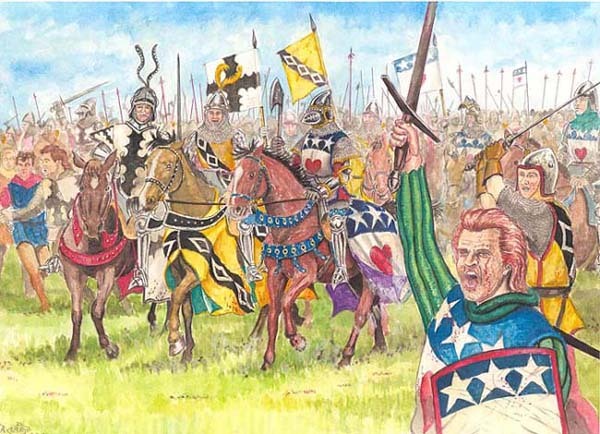 Scotland as a nation was formed through centuries of blood shed that should be remembered but not glorified. 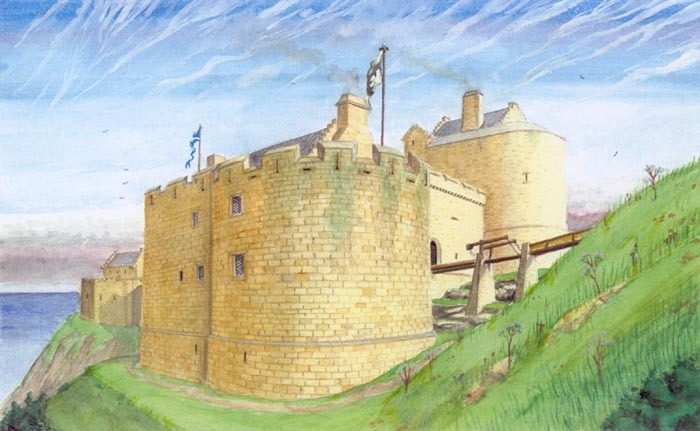 These great castles were built as symbols of power but also as places of refuge to protect the Scots who lived in fear through years of invasion, raids, wars, counter invasions and political treachery. Scotland as a nation should learn from it's past not to make the same mistakes twice. These great ruins throughout Scotland stand as reminders of our uncivilised past. 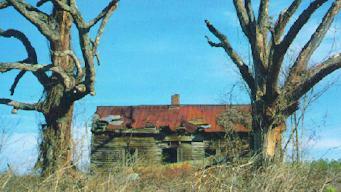 By the way, the Mel Sinclair Castle needs a little work and we are definitely accepting contributions! Please let me know that you visited! Sign my guestbook, linked from my home page. "To discover new oceans, you must first lose sight of the shore."